mini PDF to Word Converter software doesn't require with Adobe Acrobat, and Microsoft Office. That means this program doesn't need third party's program support. You can do conversion without Adobe Acrobat and MS office. mini PDF to Excel Converter does batch convert Adobe Acrobat PDF files to MS Excel documents, you can use PDF to Excel Converter to quickly and easily create highly-editable XLS files, making it a cinch to re-use tables and spreadsheets from PDF files in Microsoft Excel, OpenOffice, Google Docs, and WordPerfect Office. mini PDF to Excel Converter does the best job of maintaining look and feel to match the original files. mini PDF to Excel Converter software doesn't require with Adobe Acrobat. You can do conversion without Adobe Acrobat installed. 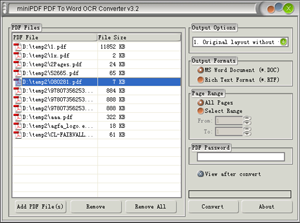 Convert Image (Scanned) PDFs to Editable Excel documents.